The Al Hosni Group International ( AGI) was established in the mid-1970s with the support and encouragement of the Government of the Sultanate of Oman as the nation was beginning to experience rapid economic growth. Over the years, AGI has gradually expanded in tandam with the country’s economy to reach, today, the status of supplying the local market with premium omani products and high service standards. AGI is based on clear vision and objectives. Its philosophy is to meet the market needs by presenting competitive products and services without compromising on quality. AGI operates in various sectors such as trade, manufacturing, industry, tourism and real-estate. It has gradually expanded to serve the international market. Today, AGI comprises over 20 companies, which serves the markets of several countries in the GCC, Middle East and Africa with top quality and trusted Omani products. I would like to take this opportunity to express my gratitude and appreciation to AGI management and staff for their dedication and hard work, which has been instrumental in the company’s growth. I am also grateful to our valued customers for their trust and confidence in our products and services. Finally , I would like to acknowledge and thank all AGI suppliers for their commitment and cooperation. Al Hosni Group International will continue its devotion to drive business to the highest satisfaction of its customers all over the world. 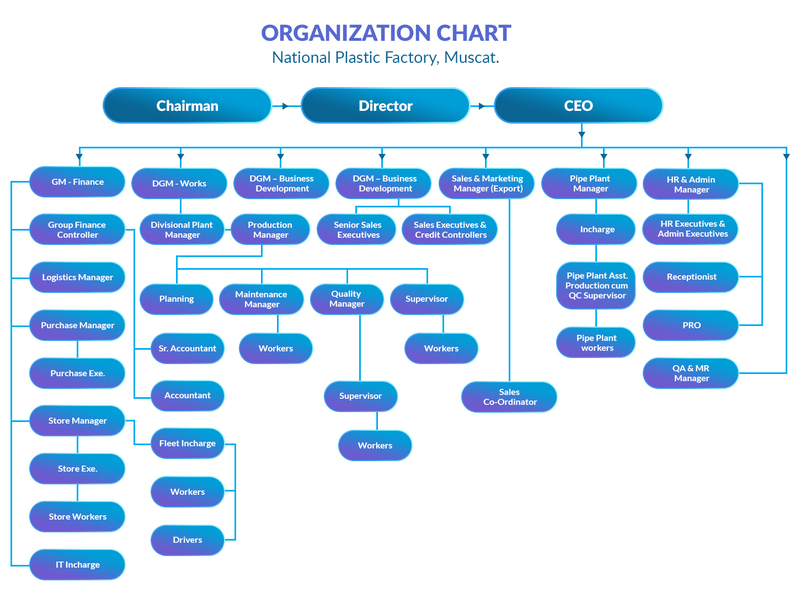 We National Plastic Factory LLC is an ISO 9001, 14001 , 18001 Certified company and started its manufacturing operation in the year 1992 under the umbrella of Al Hosni Group International in Sultanate of Oman. We are the leading manufacturers of FMCG & Industrialand Household Plastic Packaging Products serving to industries such as Personnel Care , Home Care , Cosmetic, Food & Dairy , Chemical & Detergent, Oil & Lubricant, Aerosal, Perfume and Paint industry & Integrated manufacturing. We also a manufacturer and supplier of ‘HOTACE’ Brand uPVC Electrical conduit, Truncking ,uPVC pipes & fittings for agriculture & garden , Drainage & Sewerage Pipes , soil and waste pipes , HDPE Pipes & Fittings, PPR Pipes and Fittings for plumbing application. All this product developed for focusing to serve the construction industry and infrastructure development for Local and Export market. National Plastic Factory LLC is constantly upgrading with the growing technology, Experience and Quality to meet the ever growing demand of local and international market in the region with stringent quality requirements. We are pioneer / leading famous FMCG Plastic Packaging supplier for many MNC brandings in RUMENA regions. The manufacturing plant is located in OMAN, UAE& EGYPT. We National Plastic Factory LLC is an ISO 9001, 14001 , 18001 Certified company . The Fujairah UAE factory started its manufacturing operation in the year 2007 under the umbrella of Al Hosni Group International ,Sultanate of Oman.We are the leading manufacturers of FMCG& Industrial andHousehold Plastic Packaging Products serving to industries such as Personnel Care , Home Care , Cosmetic, Food & Dairy , Chemical & Detergent, Oil & Lubricant, Aerosal, Perfume and Paint industry & Integrated manufacturing. We also a supplier of ‘HOTACE’ Brand uPVC Electrical conduit, Truncking , uPVC pipes & fittings for agriculture & garden , Drainage & Sewerage Pipes , soil and waste pipes , PPR Pipes and Fittings for plumbing application. All this product developed for focusing to serve the construction industry and infrastructure development for Local and Export market. The manufacturing plant is located in OMAN, UAE & EGYPT. We National Plastic Factory LLC is an ISO 9001, 14001 , 18001 Certified company . The 6th October – Egypt factory started its manufacturing operation in the year 2008 under the umbrella of Al Hosni Group International ,Sultanate of Oman. We are the leading manufacturers of FMCG & Industrial and Household Plastic Packaging Products serving to industries such as Personnel Care , Home Care , Cosmetic, Food & Dairy , Chemical & Detergent, Oil & Lubricant, Aerosal, Perfume and Paint industry & Integrated manufacturing. We are pioneer / leading famous Plastic Packaging supplier for many MNC brandings in RUMENA regions. Going towards a continuous improvement plan and organizational activities at establishing our company as a pioneer supplier of high quality plastic products, while serving both local and international markets alike.